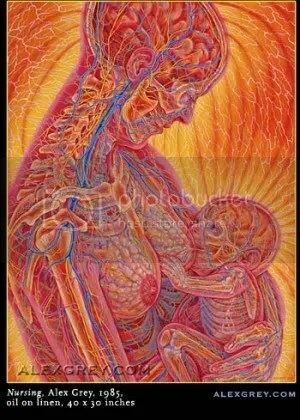 Image by Alex Grey via Hella D.
“There are various other definitions of sacrament, I like this one because it makes me think of the gut-friendly micro-organisms that grow in milk–uniquely active indeed. This is a post I have been putting off writing and I understand why. I am not sure if I can quite capture what I want to say here, but I have to give it a shot. “Professor Joseph Heckman’s advocacy to legalize the sale of raw milk in New Jersey has made him the target of some harsh criticism. One Rutgers food scientist recently accused Heckman of championing a product that is potentially deadly. “David Hochstetler doesn’t want to be in the limelight. “I’d rather just be left alone,” he said. 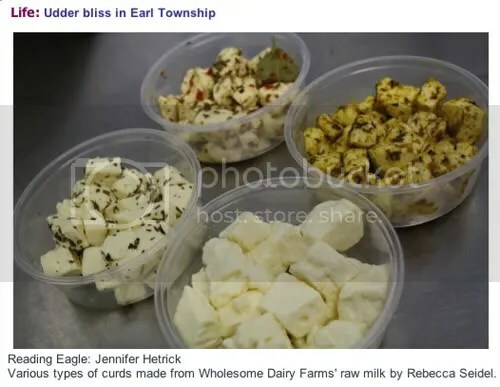 “At Wholesome Dairy Farms in Earl Township, a few dozen grass-fed Ayrshire cows are the bosses, bringing to the fridge the richly-flavored supply of raw milk that sets this operation apart. The dairy came to life in the first warm days of 2008 at the hands of Mark Lopez, who grew up in Lancaster County.